NeuroRehab Allied Health Network is a dedicated rehabilitation service catering to the unique needs of those with neurological injuries, as well as individuals seeking general rehabilitation. 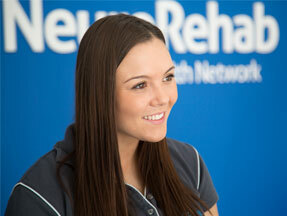 Our innovative Deer Park, Thomastown and Werribee clinics offer the latest rehabilitation equipment. We also provide an extensive home visiting service throughout metro Melbourne and surrounds. Our team of experienced neurological physiotherapists, accredited exercise physiologists, occupational therapists, speech pathologists, music therapists, neuropsychologists, remedial massage therapists, and allied health assistants, provide comprehensive rehabilitation services to maximise outcomes. We tailor programs to an individual’s unique situation, catering to clients of all ages, from those in a minimally responsive state to those wanting to learn to run or ride a bike again. We provide a full range of therapeutic supports and support worker options for NDIS participants which are funded under the capacity building and core support categories. Click here or call us on (03) 9361 2234 for further details. NeuroRehab Allied Health Network respectfully acknowledges the Traditional Owners of Country throughout Victoria and pays its respect to the ongoing living cultures of Aboriginal peoples.